Freedom and Flourishing: Do people with strong emancipative values give lower priority to economic growth? 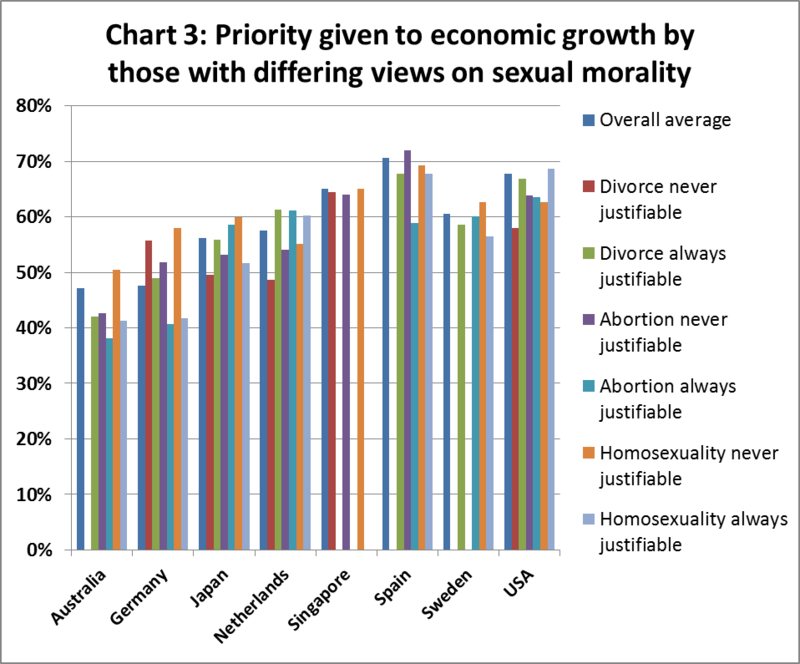 Do people with strong emancipative values give lower priority to economic growth? This question is worth considering because previous posts in this series (links here) have discussed how economic development has been associated with the strengthening of emancipative values and more widespread opportunities. This means that the ongoing generation of more widespread opportunities for individual human flourishing depends on a substantial proportion of the population maintaining a fairly positive attitude towards economic growth. The measure of priority given to economic growth that I have been using comes from World Values Surveys (WVS) which asks people to choose from four options what they consider to be the most important aim for the country they live in over the next ten years. The options are: a high level of economic growth; strong defence forces; people have more say about how things are done at their jobs and in their communities; and trying to make our cities and countryside more beautiful. I have used the percentage for whom economic growth is first choice as an indicator of priority given to economic growth. The perception that non-economists have of economic growth may be a much more defensible concept than growth in per capita GDP as conventionally measured. I don’t have concrete evidence, but I suspect that when non-economists favour economic growth what they have in mind is expansion of economic opportunity, rather than a particular income concept. Before looking at the evidence I thought that people who have strong emancipative values would tend to give relatively low priority to economic growth because “people have more say” is one of the items which Christian Welzel used in constructing his emancipative values index for his book, Freedom Rising. By definition, people who give highest priority to 'more say', give lower priority to economic growth. 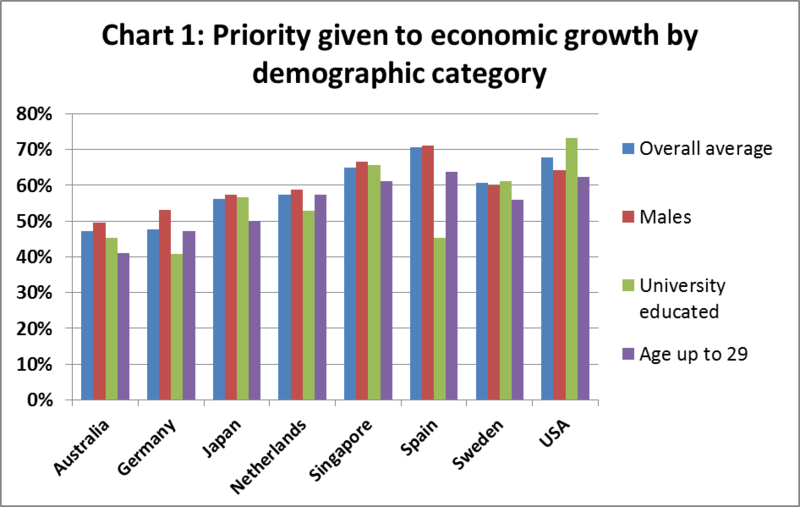 As a preliminary exercise, Chart 1 compares the overall average priority given to economic growth in each country with that given by members of different demographic groups. There does not seem to be any consistent pattern of difference between various groups within countries, except perhaps a tendency for young people to give lower priority to economic growth. 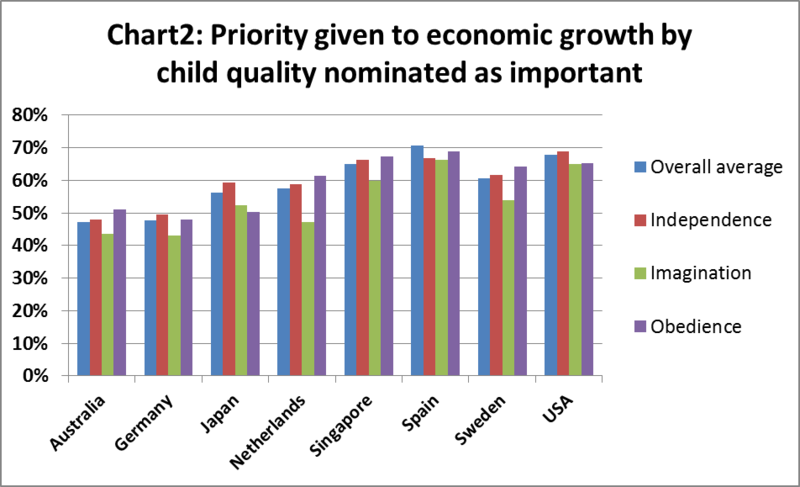 Chart 2 compares the overall average with priority given to economic growth by people with different views on desirable attributes for children to learn at home. Independence and imagination reflect positive emancipative values, whereas obedience is considered as negative. Perhaps those who see imagination as a desirable quality may be slightly less enthusiastic about economic growth, but otherwise there does not appear to be a consistent pattern. Chart 3 compares the overall average with those of groups expressing strong views on whether divorce, abortion and homosexuality are justifiable. Again, there does not seem to be any consistent pattern. 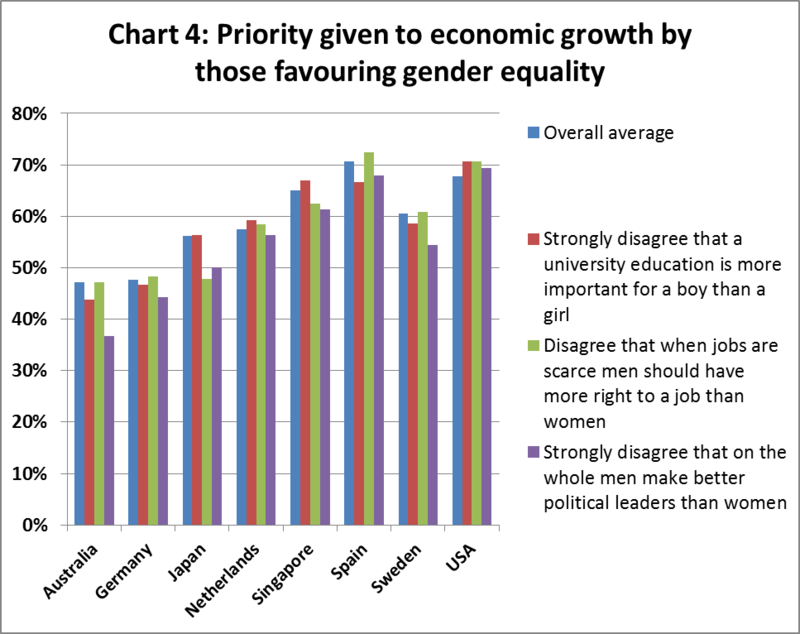 Chart 4 compares the overall average with the priority given to economic growth of people favouring gender equality. The chart shows some interesting facts e.g. people in Australia who strongly disagree that men make better political leaders than women are much less likely to view economic growth as having high priority than are other people in Australia. However, no consistent pattern of difference between the different groups in different countries is obvious. 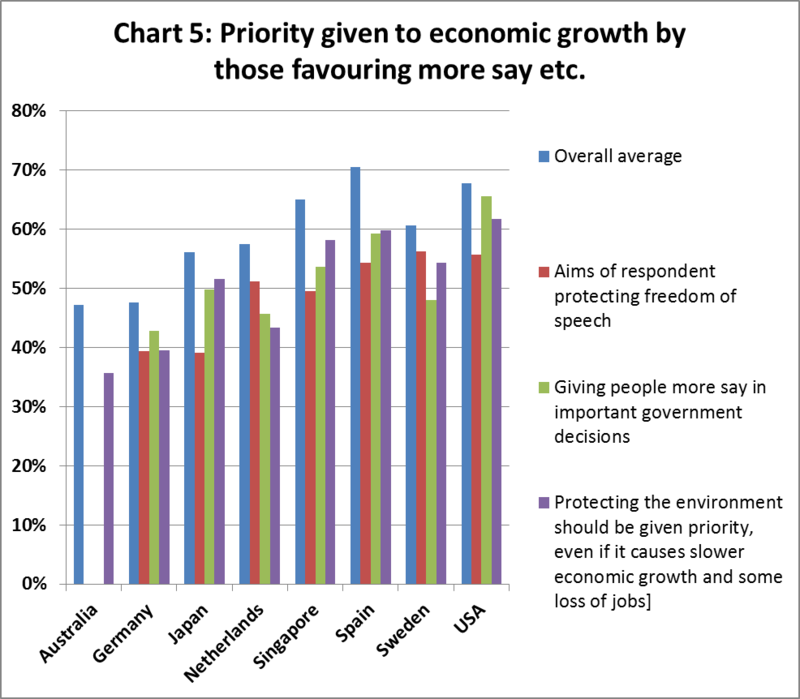 Chart 5 compares the overall average with the priority given to economic growth of people who see protecting freedom of speech and giving people more say in government decisions as particularly important. In this instance a fairly clear pattern is evident – a lower percentage of those holding emancipative views give high priority to economic growth. This chart also shows the growth priority of those who consider protecting the environment should be given priority, even if it causes slower economic growth and some loss of jobs. This item is not a component of Welzel’s emancipative values index, but it also worth considering the priorities of those who see environmental protection as having high priority. As would be expected given the wording of the question those who consider protecting the environment should have high priority are less likely to give high priority to economic growth. However, the difference is not as large as I thought it might be. The general conclusion that I draw from this exercise is that there is not a consistent tendency for people with strong emancipative values to give lower priority to economic growth than is given by other members of the populations of wealthy countries. People who attach great importance to having “more say” seem to be less inclined than the rest of the community to see economic growth as having high priority, but that observation does not apply consistently to people who attach importance to individual autonomy, respect choices that individuals make in their personal lives and favour gender equality. As a general rule, the differences in economic growth priorities of people in different countries are more marked than the differences between different groups within countries.